African academies tap Patz to chair 20-nation joint meeting on climate change. MADISON, WI – Living on a continent already vulnerable to drought, flooding and heat, scientist from 20 African Academies of Science gather Nov. 13 and 14 to discuss climate change and build interdisciplinary bridges to address it.Dr. 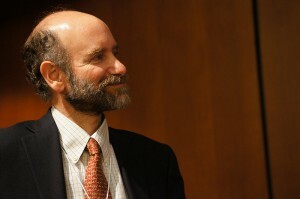 Jonathan Patz, director of the Global Health Institute (GHI) at the University of Wisconsin-Madison, chairs the meeting in Addis Ababa, Ethiopia, that takes on added urgency in light of the September findings from the United Nation’s International Panel on Climate Change (IPCC). The panel found continued climate warming, unprecedented loss of snow and ice cover, increasing levels of greenhouse gasses, rising sea levels, and a clear link to human activity. “Africa is an especially vulnerable region for climate change,” said Patz, who served for 15 years as a lead author for the IPCC which shared the 2007 Nobel Peace Prize with Al Gore and co-chaired the health report of the first US National Assessment on Climate Change. In September, Patz also delivered a keynote address on the subject for the U.S. National Academies Institute of Medicine’s forum on environmental change and infectious disease. 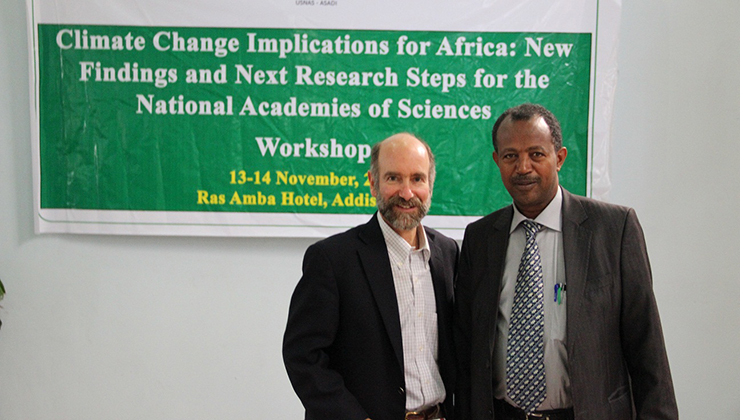 The African academies looked to Patz because of his long-standing work on the societal threats posed by climate change and for his willingness to help, said Professor Shibru Tedla, executive director of the Ethiopia Academy of Sciences, the host organization for the workshop. “Convening multinational science academy members from across the continent reflects the high priority we place on climate change implications for Africa,” Tedla said about this high-level workshop. African academies will able to provide policy advice to their respective governments on issues related to climate change based on scientific evidence. “The likely impacts of climate change have become evident this time more than ever,” said Dr. Belay Simane from Addis Ababa University and workshop facilitator, referring to the latest IPCC report. “Climate challenges will be most experienced in Africa due to low adaptive capacity and limited technology,” he added. Simane has written about a critical need to enhance Ethiopia’s capacity to cope with climate change to protect food and water supplies, especially in the highlands, home to 90 percent of the country’s population. Patz, who is also a professor in the Department of Population Health Sciences and the Nelson Institute for Environmental Studies collaborated with faculty in the institute’s Center for Climatic Research (CCR) to review the latest IPCC report with a focus on Africa. “CCR’s synthesis from the IPCC findings was worrisome, showing much of Africa likely reaching average summer temperatures 2 to 3 degrees celcius (or 4 to 5 degrees farenheit) hotter by the year 2055,” he said. “(African) climate research is currently done in silos, leaving other departments and universities unaware of other related research,” said Dr. Simane, who is also faculty in the university’s Climate Science Centre. With this meeting, African scientists begin to establish a national knowledge-sharing network that will bridge the information gap between academics, experts, and policy makers. This effort shows the academies are on board to address climate change and will map a way forward to generate information, prepare joint proposals and build capacity to address issues, he added. During the Addis Ababa meeting, African scientists will discuss priorities, including food security, the spread of infectious diseases, and the future of renewable energy in the face of climate change. They will move forward on research, interventions and evaluations of the interventions. The Academies of Science are coming together in a serious way, Patz said. With the African Union also based in Addis Ababa, this collaborative model could become the way of the future in Africa. “I feel lucky to participate in this kind of activity,” he said. UW-Madison is deeply involved in Ethiopia thanks to early work by Dr. Girma Tefera, a native Ethiopian and UW-Madison professor of vascular surgery, Patz said. Tefera, also a GHI advisory member, led a 2009 program that linked UW Hospital and Clinics with the University of Addis Ababa’s Black Lion Hospital to build, manage and lead a successful emergency department. GHI faculty and staff have further added to his efforts, establishing training programs in Primary Care and Health System Quality Improvement. UW departments of pediatrics and obstetrics and gynecology are planning training programs in Ethiopia. The College of Agricultural and Life Sciences also has ongoing research addressing climate and food security in Ethiopia. To bring what he calls a “whole of university” integrated approach to work in Ethiopia, Patz looks forward to filling a gap in environmental health collaborations, including designing sustainable, livable cities as rural populations move into urban centers. “They haven’t built the infrastructure yet in the smaller cities and are not overly committed to fossil fuels for urban transportation,” Patz said. “It’s a golden opportunity to do it right the first time.” UW-Madison scientists also will help establish Addis Ababa’s first air quality monitoring system and are planning rural biogas and solar energy projects to reduce deforestation and provide power. Next post: Save the Date!